North African spices are among the most enticing in the world, and I wasn’t about to buy them pre-packaged in sterile little packets at the Monoprix supermarket near my apartment. 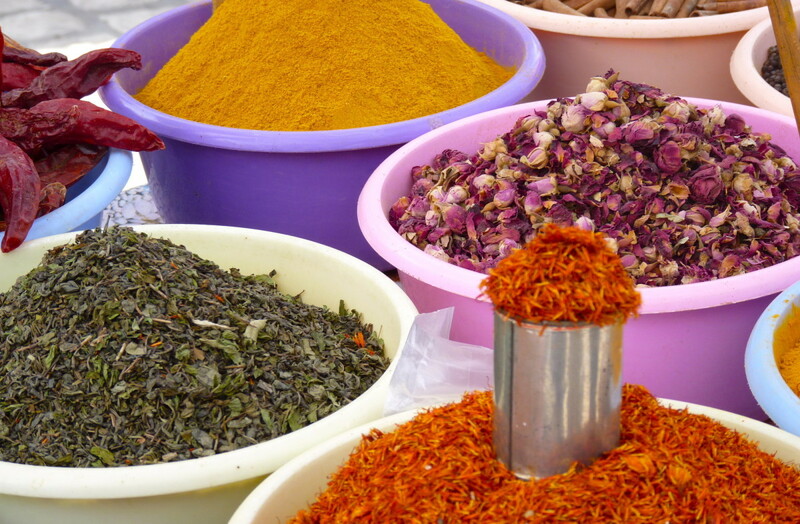 Two colleagues from the university, where I was working on a teaching grant, told me that the Bled el arabi (literally, “Arab town”), a medina in the heart of the historic center of Sousse, had the freshest spices. They offered vague directions. Enter the medina at Place Farhat Hached, they said. Turn left and walk around the mosque. Look for the narrow street with the spice shop on the left. But the thought of venturing into the medina by myself was daunting. Built during the 800s in the first centuries of Islam, it was a free-form labyrinth. On one of our first days in Sousse, my boyfriend, David, and I had walked through its twisting alleyways until we found ourselves in an empty corridor along a wall of the kasbah fortification that stands at the western edge. We had wandered along, looking at the crumbling houses, a rooster tied to a tree, some bread left by a trash dumpster, when a disheveled old man sitting on a stoop gestured for us to stop. “Closed!” he said, pointing in the direction we were headed. It didn’t look closed, but what did I know? “This way,” he said. We turned right and continued down a set of stairs. He followed closely, pointing out two hand-shaped knockers on a door, which meant that two families lived there. I had a feeling he was not telling us this interesting detail out of simple kindness, but sometimes it was hard to tell. Many people were very kind for no reason at all. We couldn’t shake him as we walked back toward the center of the medina. He insisted on following, waving his hands in a way that seemed to mean: “I don’t want your money.” But then, just as we were about to rejoin a main thoroughfare, he maneuvered in front of us and stuck out his hand. David gave him a few dinars. I felt stung. On our own again, we plunged into the crowded souks lined with household goods, candy, clothing, and souvenirs, and vendors began calling out to us, sometimes in English, other times in Arabic, French, Spanish, German, or Italian. They couldn’t tell what we were, just that we were different. But David was as tense as I had ever seen him amidst all the jostling. I was trying hard to keep a sense of humor. But the vendors came close and spoke loudly, and they were just one aspect of the sensory overload of the medina—with its swirling colors, loud music, pungent scents, and tightly packed streets. 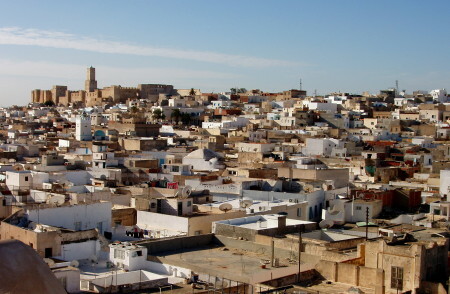 We picked up the pace, winding our way into the clearing by the conical tower of the sand-colored rabat. I wanted to catch my breath and keep going, but David was finished. As we had squeezed through crowded sections, he had felt people lifting the back of his shirt to check for a wallet in his back pocket. And so we made our way to the exit at Beb Bhar, the gate to the sea. When we talked about our experience later with a European expat couple we had met, the husband urged us not to go there. “You would not even believe the things they are saying to you in Arabic when you are passing through. They are cursing your mother,” he told me, very seriously. His wife said, “If I have to go there, I am like a horse, with my sunglasses and my headphones, staring straight ahead. I am not even responding if anyone says something to me. It’s disgusting!” She said the prices we would be quoted as Westerners would be outrageously inflated. But we had experienced difficulties with shopping even in places where prices were marked. I had bought a printer at a big French chain called Carrefour, only to discover it did not come with the cord needed to actually connect it to a computer. So a few days later, David and I had walked about forty minutes over dusty, trash-strewn streets into a section of town that appeared devoted to automotive repairs. Stores and services of the same kind tended to cluster together in the same neighborhood like the souks of yesteryear. We went there because David had read online about a place that sold electronics in Sousse. But this was another difference about life in Tunisia: very little that you needed in the course of everyday life could be found on the Internet. It was much better to ask people for help. But we hadn’t yet learned that lesson. And so we wandered, lost, around an unfamiliar neighborhood, and eventually we did find an electronics shop that sold the cord. Whether it was the same one David saw online was anyone’s guess. But I still had no paper on which to print. A colleague at the university told me I would have to go to a librairie to find it—a place where school supplies and stationary are sold. A few days later, I took a chance and returned to a street in downtown Sousse where I thought I had seen children’s backpacks hanging in a store window. I could have kissed the man behind the counter who, when I said papier pour la ourdinateur, pulled out a package of regulation printer paper. It had taken me three separate trips to different parts of the city in order to finally assemble all of the equipment I needed to print at home. But I was determined to get those spices. So I steeled myself for commentary from the vendors, put just a little bit of money into my pocket, and set off for the medina by myself. My sense of tension was heightened by the fact that less than a year had passed since the revolution, and Tunisia was still technically in a state of emergency, though few signs of that were visible in the streets. I went left around the mosque, keeping my head down and walking quickly, ignoring the shouts from vendors. I ventured down several narrow little streets before locating a man with a small white cart of spices. A little girl of three or four was playing at his feet. This was comforting, as was the kindness of his smile. I pulled the list of spices I had made—and translated into French—out of my pocket and showed it to him. Like a good salesman, he suggested substitutions for the items he didn’t have, offering me smells of intensely scented spices from jars he opened and stuck in my face. “This,” he said, gesturing to a jar of cannelle (cinnamon), “if you put a little bit in very hot water and drink, is good for a sick stomach.” I wondered if he saw a lot of tourists with stomach issues. He wanted to give me five dinars’ worth, but I told him I only needed two. Then he showed me the mint tea. It was a mixture of green tea leaves and dried mint, and when he crumbled a pinch of it and stuck it under my nose, it smelled heavenly, just like fresh mint. I was about to refuse because I had been warned that spice blends sometimes contain a lot of filler, but then I noticed the words Ras el Hanout scratched faintly on the outside of the container. This was the famous North African spice blend rubbed on fish and meats and used in all kinds of tantalizing dishes. It was supposed to be made from the “top of the shop” (the literal translation of the name) and could contain chili peppers, cardamom, cinnamon, cloves, nutmeg, rosebuds, peppercorns, turmeric, and more. These were toasted and ground together in a mixture particular to each spice maker. I quickly agreed to buy it at a slightly higher price than the others. I had asked him to label the bags for me so that I wouldn’t get them mixed up, but we couldn’t figure out a way to write on them without tearing the thin plastic. Instead, he patiently went through them again, repeating each name and asking me to sniff and memorize it by the smell and the color. Yellowish-greenish brown for cumin, darker brown for coriander, lighter brown with flecks of yellow for the Ras el Hanout, deep red for paprika, and so on. By the end, I was dizzy with pleasure from breathing in the pungent aromas. I realized that if I was persistent enough–and willing to push past my own initial discomfort–I could find what I was looking for in the medina, and maybe in Tunisia, too. The spice seller couldn’t help with the thyme and rosemary David requested, nor the cloves, which he dismissed as “not a spice.” Perhaps my translation was bad. He did urge me to buy some sandals at his friend’s shop farther down the alley, and when I declined, he didn’t press me. We shook hands, and then he reached down to wipe a bit of yellow turmeric from his daughter’s upturned face. I told him I would be back to see him when the spices ran out. Andrea Calabretta is a writer and editor whose work has appeared in The Boston Globe, Plenty Magazine, Your Middle East, and other publications. She traveled to Tunisia on a Fulbright fellowship.